Bingo acts as the automatic caller in the classic English game of Bingo (sometimes called ‘housey-housey’). 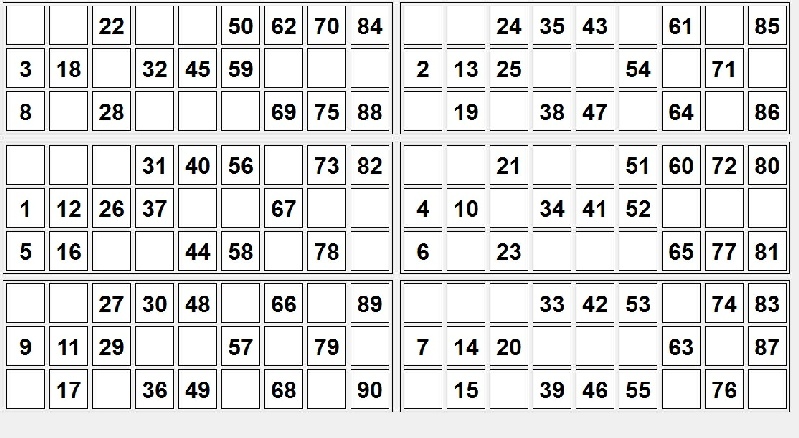 Note that this differs from the USA version by being played using tickets with 3 rows of 5 numbers in a 3 x 9 grid with scattered spaces, and numbers being drawn randomly between 1 and 90. A recent (24/03/2014) facility has been added to create these tickets as an A4 jpg file which are derived from a generated screen-capture. This was not an easy algorithm to implement which is why it has only recently been added. If you think otherwise, bear in mind that each ticket must have 5 numbers per row, each number must be in its correct column, no column is allowed to be empty and each sheet of 6 tickets must contain each number once only. Then give it a try yourself in your language of choice! Alternatively you can use the cards that come with a child’s “Lotto” game, but these will, of course, be the same for each game. It is commonplace for verbal descriptions to be used for some of the numbers especially where these are traditional (e.g. “Key of the door, 21”) and there is a startup option for these to be shown on the caller screen if this is required (if a child who is not familiar with the descriptions is calling the numbers for example). Alternatively the number can just be called simply as, for example, “two and one, twenty-one” without bothering with the descriptions. 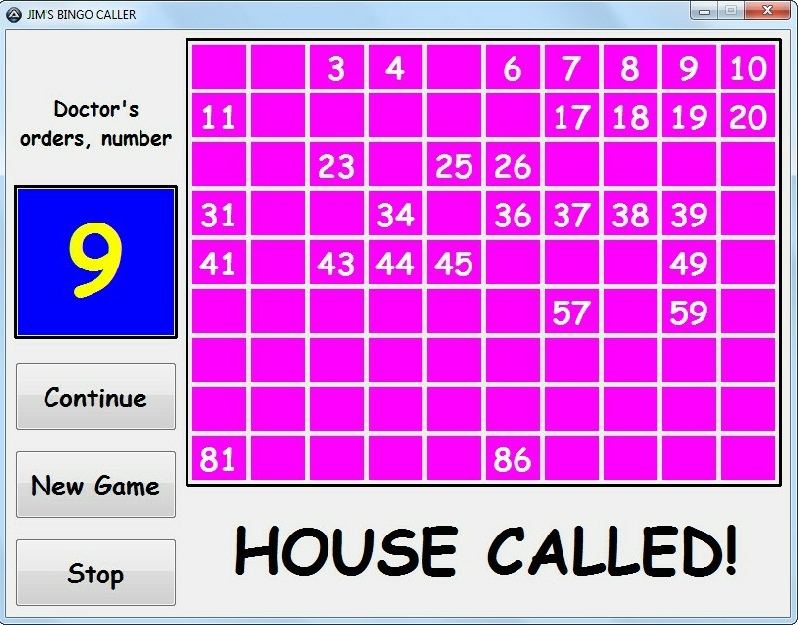 The game ends (or halts) when someone shouts “house!” (or “bingo!”) at which point the number-caller presses the ‘house called’ (Enter) key and then checks the numbers on the shouter’s ticket against the called numbers on the on-screen board. If a mistake has been made then a ‘false call’ is declared and the game continues, otherwise the call is declared valid and the shouter given whatever prize is up for grabs. Sometimes several games are played on the same ticket (such as for one line, two lines then a ‘full house’ - all three lines) so play can continue after a call has been made and verified or a new game commenced from the start. The [General] Section: This contains just one setting for the Title and allows you to personalise the title at the top of the window.